We all use skillets and pans so often that we can’t even count. Some of us use it on a daily basis. Baking eggs, frying chicken, making that favorite Chinese dish…The possibilities are endless! That’s why it so important to find the right one. My grandma used only one skillet her whole life! Nothing can beat a good, sustainable cast-iron skillet. It may seem old-fashioned, but it is a must-have in the kitchen. I love cooking cornbread in it. It gets a nice, brownish color and its aroma takes me right back to childhood when my granny used to make it. I remember we would rush to gather around the kitchen table to eat it. It was so warm, and it tasted just like home. We would all chat and joke about my brother’s incredible talent for painting. Every time he’d go out of the house he would paint all of his clothes in black and brown. Those were the times that made me fell in love with cooking. Today, I want to make the same memories with my children. It was a long road until I got to that perfect cast-iron skillet. Let me tell you what I’ve learned, so hopefully, yours is going to be much shorter. Today, when I am buying a pan, I look for something similar to my granny’s one. I always keep in mind all of her advice. I wouldn’t settle for anything less than that. I must admit, it is so difficult to find the cast iron skillet of the same quality in today’s market. It’s just because the way of production has changed. Still, there are good ones. Okay, so what can go wrong when we buy a fallacious cast iron skillet? Some poorly-made skillets can lose their shape after a while. As a consequence, when you want to bake something in it, all of the oil and liquids slides to the bottom of the pan. We all know how annoying can that be. Also, the meals would be baked unevenly. So, we want the ﻿﻿skillet to be time-resistant. Consider the size, depth, and weight as well. The size depends on your needs, the number of family members and the type of meals you use it for. You should consider all of that before shopping. You don’t want a pan that can’t fit the four steaks that you want to make for your big family dinner. It saves you a lot of time if you can fry them all at once. The depth is also a significant feature. If you are a fan of quick and easy stir-fry meals, this is a must! You want to mix all those vegetables and chicken with sauce easily. One of the reasons why we sometimes choose to avoid the cast iron skillets is because they can be so heavy. I cook because it relaxes me, not because I feel like it’s time to build my biceps. The lighter it is, the better it is. In general, cast-iron cookware is heavy. Also, it is made from one material only, so heat transfers rapidly. You have to careful not to burn yourself with it. But, some manufacturers found a solution for that. It’s fixed with a good, comfortable handle. There are models with silicone handles manufactured today so that you can have a natural grip around it. Plus, you don’t need a kitch﻿en glove or a towel to use it. It’s important that the handle maintains a safe, stable transfer from stove to the oven or the kitchen table. We want a skillet that it’s easy to use, that makes our food as tastier as possible, but also that’s easy to take care of. We don’t want to fall into an endless battle of dealing with a greasy pan. There are so many advantages of this inexpensive kitchenware. But you do have to invest your time and energy to maintain it. Even though this is something that we can’t avoid, what we can do is to look for products that will make it easier for us. Most of the skillets in today’s market come pre-seasoned, so they are ready to use when you buy them. This is also a plus because it saves you time and makes the texture of the skillet smoother. But, you do have to be careful about keeping it from rusting. Let’s talk a little bit more about that. Seasoning is the most important part of maintaining your cast-iron skillet. Iron itself is not a well-behaved material when cooking. You need a protective layer on top of it. When it’s left on its own, iron rusts very quickly. And not only that, the food will stick to it as well. That’s where the seasoning steps in. It produces a layer of fat that converts into a form of plastic. When you heat the oil on it, it bonds with the metal and goes through the process of polymerization. After you season your skillet for a few times, you will get a skillet that has a hard, non-sticky protective layer. So, the more you cook with it, the better it gets. If this seems like a lot of trouble to you, don’t worry. Seasoning can be done in a few easy steps. There are numerous benefits of this iron-made cookware. If being versatile, cheap and long-lasting isn’t convincing enough for you, read on. When a cast-iron is seasoned, it gets an amazing non-stick surface that will make even the greasiest meal a pleasure to cook. Plus, that means that you can use less oil that with o﻿ther cookwar﻿e. Another strong benefit is that cooking in it adds iron to your food. We all struggle to keep an optimal amount of iron in our daily food consumption. This cookware helps you provide the 18 mg that adult women need on a daily basis. Wow! I didn’t know about this one only until recently. Having a big family dinner is a pleasure with this kitchenware that stays hot for so long because it has excellent heat retention. So, the meal will be warm through the entire dinner. In its natural simplicity, it has one more paramount advantage. It is free of harmful chemicals, unlike some other non-stick skillets! Lodge is among the oldest cookware-making American companies – it exists since 1986. A lot of my kitchenware is from their family of products. It’s safe to say that they are reliable, so, I tried out their 10.25-inch skillet first. First of all, I must say that I imagined it a bit bigger. I would definitely recommend buying one size up. This is a lovely, useful skillet that worked out fine. It has a regular and a small side handle, which comes in handy. It is not expensive and comes pre-seasoned which is a plus. It is supposed to be ready for use when you unpack it, but I must admit I had problems using it before I decided to season it myself. The food was sticking to it. Nonetheless, after seasoning it myself, I had no issues with it. Be careful though. In the beginning, it has some brown spots that remind of rust. But it’s just a seasoned spot that is brown, indicative of the varnish stage of seasoning. My friend bought it too, and she thought it’s rust, so she threw it away with resentment. But, although it may be irritating, this is not a problem. It’s not ruining your food, and it goes away after few weeks. 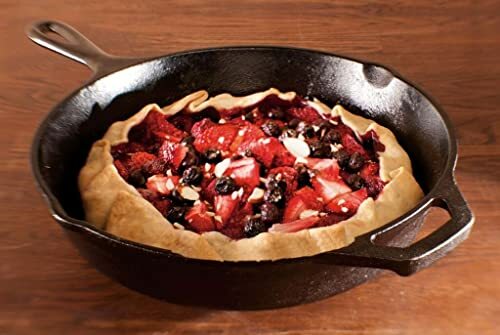 When I saw this skillet on American Test Kitchen, I immediately rushed to buy it. The pan looks exactly as advertised, and it has incredible non-stick properties. Probably the best I’ve ever seen. It comes with a helper handle, it is pretty light, so it heats up quickly, and it’s convenient to use. E83407 is pre-seasoned, cleans up well and spreads the heat out evenly. It also comes with seasoning instructions. I would use it for a long time if there weren't such a big flaw that made me look for another one. The heat indicator in the pan that tells you when it is hot enough. That’s useful, especially for beginners, but it makes the middle of the pan a little bit higher. The skillet is convex so the oil and the food slides to sides of the pan, so you cannot use its whole surface. After a while, I really got frustrated using it. Also, opposite of what’s written in the instructions, it not safe to use metal spatulas. I noticed a little scratch after using one. If you don’t mind the convex shape, it is a good use for the money’s worth, and you could use it for a long time. Just be careful not to use any metal utensils, and you are good to go. I would recommend this one for beginners, because of the heat indicator and seasoning instructions. Another great Lodge’s product. I just had to try this one because of the perfect size. The first thing you’ll notice is that the pan has a silicone handle which is so convenient and comfortable to use. That feature may add to the price, but it’s worthy. It protects you from the hot iron, and it’s so soft and comfortable. I love it! The surface is even, and the heat distribution is quite well. The problem is the same as with the previous Lodge product – it’s just not pre-seasoned well enough. So, you have to be cautious not to bake food that is too greasy in the beginning. But, after a few seasoning, it works out perfectly, just like the 10.25-inch one. This skillet is a bit heavier than the others, so you should be careful when using it. Sometimes, those silicone handles can be so slippery! So, this skillet has a lot of advantages. It’s big, non-sticky, and holds the heat perfectly. You should only be careful when using it, hold the silicone handle firmly so it doesn’t slip. Another pre-seasoned skillet that needs some additional seasoning and then it’s ready to use. It’s good that it comes with a simple instructions for cleaning and maintenance. This is also a ﻿good﻿ pan, long-lasting, easy to clean. The surface is not polished enough, so it is a little bit rough. It is enough to make it cook a little uneven. And if you use paper towels to clean it, it gets caught on the surface. I learned it the hard way. Also, it is not thick enough, so it doesn’t hold the temperature like it’s supposed to. This is a decent pan, but if you are looking for something like your granny had, you will not be satisfied with it. Also, it’s a little bit expensive, so I think there are cheaper pans that are just as good as this one. But, this may not be a problem, since I found out it’s on sale now. Oh, another one with a silicone handle. That is just such a big advantage and such a convenience. I got so used to it that it is difficult to like a pan without one. I must say the price was great since I got it on sale. You might think that if it is so cheap, it won’t be of good quality, and you’d be wrong. The heats up quickly and bakes evenly. For a cast-iron skillet, it’s not as heavy, which is a plus. In the beginning, I found it too bumpy on the surface, but as the time passed by the surface got much more polished. Then again, it comes pre-seasoned, but you need to add some seasoning. I guess this is just the issue with most of the cast-iron skillets. So, a bit bumpier surface needs a little bit of extra seasoning, but other than that works out great. I must say I’ve enjoyed cooking in each of these skillets. It’s just because cast-iron skillets are such a great kitchen tool. But, as I said, I was searching for something that would last for a lifetime and hopefully become a heritage to be passed through the generations. 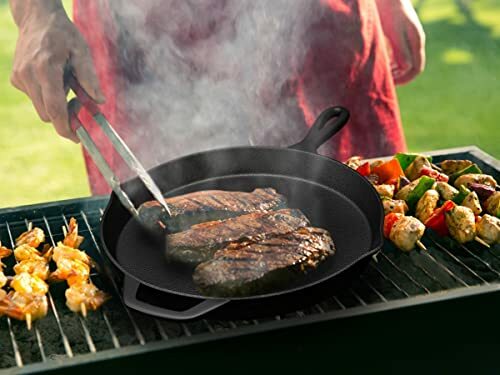 The winner is definitely the Lodge L10SK3ASHH41B Cast Iron ﻿﻿Skillet. Lodge products are the ones that remind us of traditional American family kitchen. Plus, silicone handle is a must, and it’s just perfect for use. I don’t mind the extra seasoning because I just got used to doing it. But, if you are a beginner and still don’t know how to season your skillet, I would recommend T-fal E83407 ﻿Skillet. It is the only one that doesn’t require the extra seasoning and comes with seasoning instructions. Plus, it has the heat indicator. It’s so non-sticky and easily maintainable that it will make you fall in love with iron cookware. But, because it is convex-shaped, I don’t recommend you using it for a long time. After falling in love with a cast-iron skillet, the seasoning will not be trouble at all. Let me know what’s your favorite dish to cook in this traditional, versatile cookware! I have several Lodge products but the Wagner skillet passed down from my mother-in-law makes a Lodge skillet look like it was cast by cavemen. Lodge is far from “…the ones that remind us of traditional American family kitchen”. The Griswold’s and Wagner’s our grandparents used were vastly superior products to anything Lodge has ever made. The casting of fine finished iron was a lost art in America until recently. 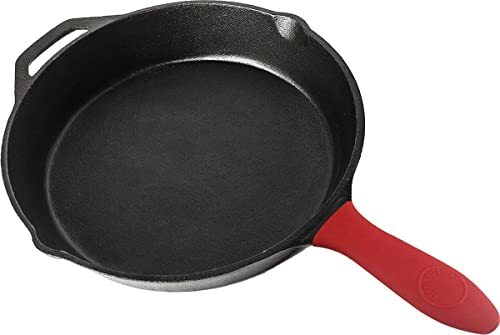 Now, Butter Pat or Field and some other small factories make excellently finished cast iron cookware comparable to what the “traditional American family kitchen” used to have on the stove. It’s weird to see the NY Times pick a primitive, cheap product like the Lodge skillet as their #1 pick. Worse that so many food bloggers publish “dittos” to the NYT, ignoring a revolution in the market they’re supposedly reporting on. I really admire your enthusiasm and how well-informed you are when it comes to cast iron skillets. I wonder, do you have your own cooking blog? If not, why not? I would be happy to collaborate with someone so ready-witted. 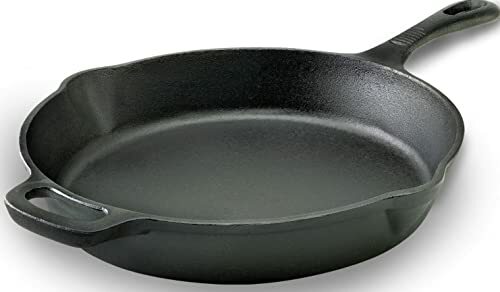 As for my answer, I would like to point out that Lodge skillet is my personal favorite, but that doesn’t mean it is absolutely the best one on the market. I might be sentimental, but just like your mother-in-law’s Wagner, Lodge runs in my family. My grandma used it, so did my mother, and me after her. Just a few days ago, my son purchased his own Lodge, and he is delighted. As much as I can see, the quality of the product didn’t change over the decades. I have to admit, both Butter Pat and Field have excellent cookware. I had an opportunity to try out the Butter Pat’s 12” skillet in my friend Jessica’s kitchen. To be honest, that was one of my smoothest, carefree cooking experiences I ever had. However, both of these brands have one significant downside – the price. 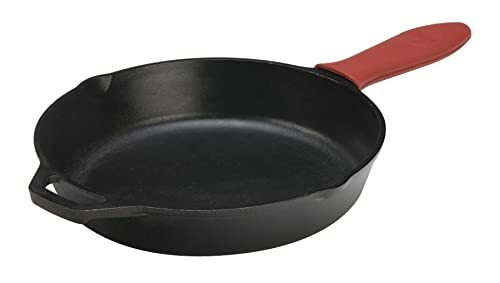 Field’s and Butter Pat’s iron skillets cost five to ten times more than Lodge’s or T-fal’s models! It is amazing when you have an opportunity to invest such money in high-quality pieces, but most people wouldn’t bother with that, which is why I prefer to present them reasonably priced, yet incredible products. I hope you understand my point of view. If you have any other questions, feel free to write here. It is a great pleasure talking to someone with such critical-thinking skills.